Looking for some old movies to watch? 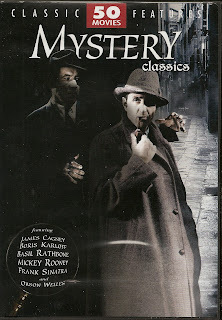 This collection of 50 black and white mysteries from the 1930's through the 1950's contains some of the better Bulldog Drummond series with John Howard, as well as the Sherlock Holmes films, with both Basil Rathbone and Reginald Owen in the lead role. I have always preferred Basil Rathbone. The collection contains, among others, Peter Lorre as Mr. Moto, John Garfield in "They Made Me a Criminal", Edward G. Robinson in "Scarlett Street", even Orson Welles in "The Stranger." They're all here, nicely packaged and arranged. Frank Sinatra is taut as a would be assassin in the 1954 film "Suddenly", as he waits to shoot the President. 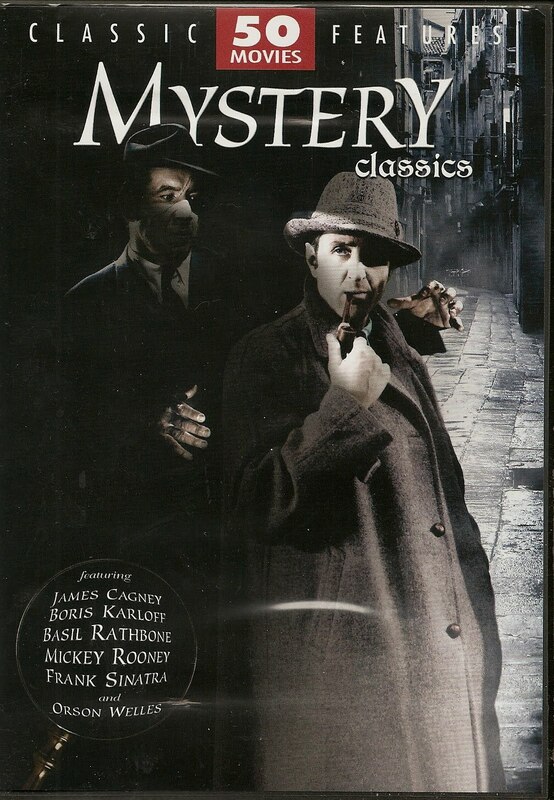 Bela Lugosi is sinister as "The Mysterious Mr. Wong", and of course Nigel Bruce is bemused, as always, while Basil Rathbone takes the measure of the case at hand, solving the seemingly impossible, while making it look so easy! Even William Powell is here, in the first of the Dashiell Hammett films he would later make so famous with "The Thin Man" series. The film here is one of Mr. Hammett's Philo Vance mysteries. Looking for a different version of James Cagney? He's here, too, as the only honest Inspector of Weights and Measures in "The Great Guy." If you like the old black and white mystery films from those rainy afternoons watching TV when you were a bit younger, this collection is made to order for you.